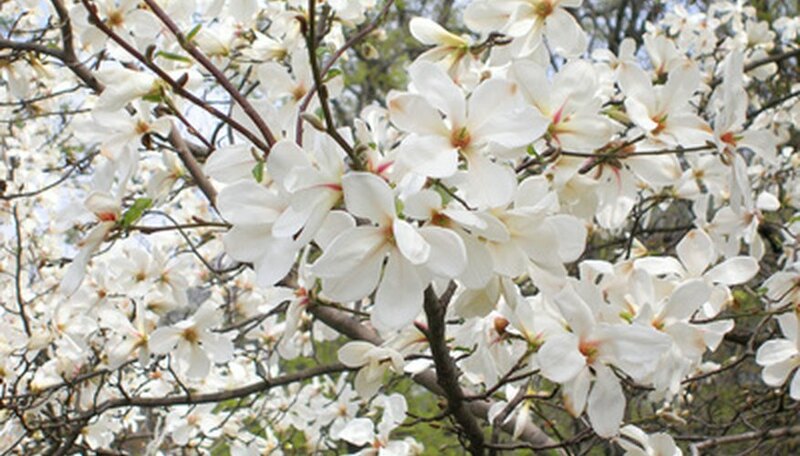 Magnolia trees develop suckers, which can be removed and planted to begin a new tree sprout. This method of propagation is difficult unless the sucker has enough of a root system established upon removal of the mother plant. The suckers removed from the parent plant are very delicate and should be handled with care. This deciduous shrub thrives in full to partial sun. Suckers perform best if planted in a container and then transplanted to an outdoor environment once their root systems are established. Remove the sucker from the mother plant. Dig the soil away from the sucker to expose as much of it as possible without disturbing the roots of the parent tree. Cut with pruning shears, removing it from the parent. Replace the soil around the magnolia’s roots. Fill a planter with ½ potting soil and ½ soil removed from the parent plant location. Apply a rooting hormone to the sucker, according to the label directions. Generally, rooting hormone is purchased in a powder form and the end of the sucker can be dipped in the powder. Place the sucker into the planter, firming the soil around it. Position it into the soil so only the top portion is exposed above the soil. Water the sucker generously. Allow the excess water to drain from the planter bottom. Water when the top 1 inch of soil has become dry. More frequent watering will result in root rot and the failure of the sucker. Fertilize the sucker with a general 10-10-10 shrub fertilizer. Follow the label directions for application, once the sucker has an established root system and is producing leaves.